Size and shape resembles Robin but slimmer, longer legged and generally more skulking. Pale, broad supercilium distinctive, and diagnostic rust-red tail-base obvious in flight or when perched with cocked tail. 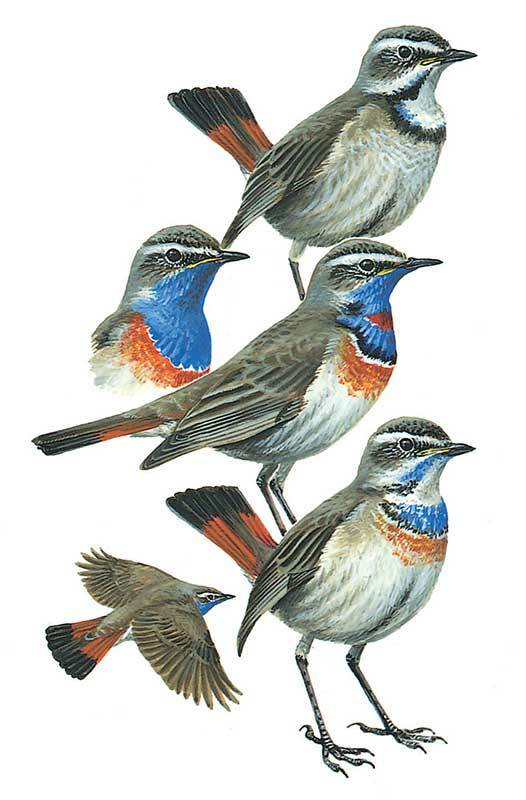 Striking features in breeding male are blue chin and throat framed below by black and rusty; depending on race the throat spot is red, white or lacki. 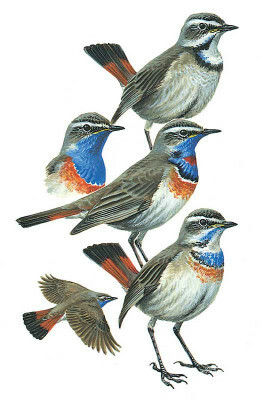 Non-breeding male, female and 1st winter have pale throat, black malar-stripe joined to dark necklace and often a varying amount of blue or red admixed. Spotted juvenile told from juvenile Robin by darker appearance and red tail pattern. Usually on or close to ground.